Heartbeat 1, Susan Aldworth, 2010. “What sets us apart is a life in the mind, the ability to imagine,” wrote the evolutionary biologist, Robin Dunbar, and I tend to agree. We are addicted to imaginative journeys – recollecting events from our past, conjuring visions of our future, exploring possible worlds in fiction and film, conceiving the workings of the quark or deepest space. For most of us, visualisation, the capacity to ‘see in the mind’s eye’, is an important element in these imaginings. 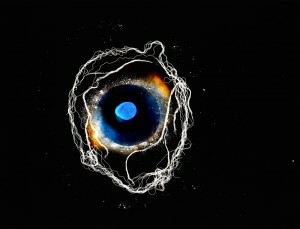 Over the past ten years, we have gained some unexpected insights into the properties of the mind’s eye. In 2003 I encountered a patient who had, abruptly, lost the ability to visualise. Previously MX, as we called him in our article, had enjoyed a vivid visual imagination, imaging the faces of his family, for example as he dropped off to sleep; when he read novels, he entered a visual world created by the fiction; when he recollected a familiar place he could ‘see’ it before him. Suddenly, after a procedure to treat a narrowed coronary artery, MX found that he could no longer visualise, though his vision was otherwise intact. Using the brain imaging technique of functional MRI we showed that when MX looked at faces, the resulting brain activation was normal – but when he tried to imagine them, visual areas toward the back of the brain were activated much less strongly than in control participants. Interestingly, his visual memory appeared to be unaffected: he could tell us in detail about how things looked, even though he could no longer see them in his mind’s eye. The findings of this study were published in the journal Neuropsychologia in 2010. The article caught the eye of the American science journalist, Karl Zimmer, who described our findings in Discover, the US science magazine. During the next few years we received a series of contacts from more than 20 people who recognised their experience in Carl’s description – except for the key difference that they had never been able to imagine. Oddly, although this phenomenon of lifelong absence of imagery had been highlighted by Sir Francis Galton, the Victorian scientist, in the 19th Century, there had been very little systematic study since, with one exception: Bob Faw, an American psychologist, had suggested that it might affect 2-3 per cent of the population. We sent our contacts a structured questionnaire to learn more. They told a consistent story – they typically discovered in their teens or twenties, to their surprise, that when others spoke of ‘seeing in their mind’s eye’ they were referring to an experience which had a genuinely visual feel; as a group our contacts regarded their memory for their personal past as poor, while their capacity for abstract thought was well developed; most of them knew what it was like to visualise as they experienced imagery in dreams, or as they dropped off to sleep, although they were unable to visualise deliberately. A request to ‘count the number of windows in your house or apartment’ was especially revealing – all could do this accurately, but without consulting an ‘image’ of their home. Working with Sergio Della Sala from Edinburgh University and Michaela Dewar from Heriot-Watt University I recently reported these results in the journal Cortex. As we were describing a condition – or variation in experience – that lacked a convenient name, we consulted a linguistically knowledgeable colleague, David Mitchell, and together coined a new term. By analogy with ‘aphasia’, the loss of language, we termed the lack of the mind’s eye ‘aphantasia’, from the Greek words ‘a’, meaning ‘without’, and ‘phantasia’, meaning the capacity to form images. Our Cortex paper described cases of lifelong or ‘congenital aphantasia’. History sometime repeats itself constructively. Carl Zimmer wrote about our new work for a second time, in his column in the New York Times. The stream of interesting mails provoked by the previous article became a welcome flood. Over a thousand people have been in touch since, giving detailed and fascinating account of their experience – or lack of it. With such a large sample, themes and patterns begin to emerge: for example, a substantial proportion of those contacting us also report problems with face recognition or ‘prosopagnosia’. A similar association, with ‘weak’ visual imagery, had been reported recently, from the opposite direction, by prosopagnosia researchers. What is the next step? As ‘aphantasia’ has been such a neglected topic, there is everything to learn. Through an interdisciplinary project funded for a year by the Arts and Humanities Research Council, ‘The Eye’s Mind and its place in culture’, involving among others the artist, Susan Aldworth, art historian John Onians and philosopher Fiona Macpherson, we are planning future studies and placing ‘aphantasia’ in context. An inability to visualise does not imply an inability to imagine: imagination is a much richer, more complex capacity than the specifically visual ability lost in aphantasia. The few weeks since Carl Zimmer’s article appeared have been among the most exciting of my academic life. Why does the topic of ‘aphantasia’ touch a chord? I suspect that, as Robin Dunbar implies, the answer is that we live so much of our lives ‘in our heads’: visual imagery may not be required for imagination, but, for most of us, it is a key ingredient. Lives without imagery can be rich and fulfilling, but they are different, and remind us of the great, but easily unnoticed, range of variation in human experience. Find out more about about Professsor Zeman’s work into aphantasia in our news story. This entry was posted in research on 26th Aug, 2015 by Lara Faith Cronin. I realised a few years ago when my son was diagnosed that I had congenital prosopagnosia. As soon as I saw the info on aphantasia I recognised myself in that too. Now I wonder if I actually have prosopagnosia at all, becuase surely aphantasia would make prosopagnosia almost inevitable? I also have questions about the validity of using a group of artists as an example of the opposite to aphantasia. I am an artist, and seen as outstandingly creative in my business making unusual headpieces amongst other things. The process I use is perhaps different. When a customer describes what they want, I develop not a visual image but a ‘recipe’ for the product. I then play around with the materials until they both match the ‘recipe’ and come together in a visually pleasing way. I don’t think it makes sense to assume that artists can’t be aphantasic!